Your preschooler will love learning with the Horizons Preschool Curriculum Set. This Christian schools curriculum teaches math, phonics, language arts, and other subjects with fun activities and games you'll both enjoy. The set includes 180 lessons in two student books, two teacher's guides, a music CD, and a resource packet with manipulatives. Start your preschooler's early childhood education with the Horizons Preschool Curriculum Set! This Christian schools curriculum introduces preschoolers to formal learning with hands-on activities and games that can be easily adapted to your daily schedule. Laying a solid foundation in Christian values, each lesson starts with Scripture and flows from a biblical theme that incorporates social studies, language arts, math, phonics, science, and more! Plus, each enduring lesson is filled with arts and crafts, music, story times, health and safety, and other exciting learning adventures! The Horizons Preschool Curriculum Set from Alpha Omega Publications also includes step-by-step teacher guides that provide detailed lesson plans for each day's activities. In addition, the teacher-friendly format is flexible and allows you to add your own ideas and studies to specifically customize your preschooler's education. A sing-a-long music CD and engaging manipulatives also reinforce lesson concepts. Comprehensive and captivating, this Christian schools curriculum has everything you need to give your preschooler a complete education. 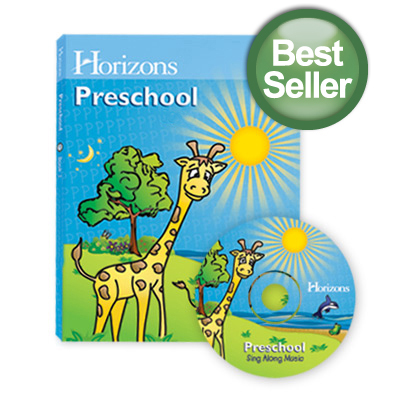 Start your child's education off strong and order the Horizons Preschool Curriculum Set today!